Polly O'Leary: No rest for the wicked! The stall was well received, with lots of interest, and plenty of business cards taken. My meagre supply of note cards swiftly disappeared and after the frantic five months of painting, it was such a relief to have such positive feedback. What wonderful people Orchid enthusiasts are! At the end of the Orchid Festival, I was astounded and humbled to be given several orchid flowers to bring home, very carefully, and paint from life. Of course, this meant that the idea of putting my feet up after such a long and intense stretch of painting and general getting everything ready, not to mention the festival itself, was not going to happen. You can't put many Orchid flowers in the fridge to extend their lives, it often has the opposite effect. So they were placed in sealed pots with damp paper. Instead, out came easel, pencils, paints, ink, dividers, rulers and paper, and of course the magnifying glasses and loupes. And so the race against time began. One of the Orchids, a Stanhopea, only lasts about 4 days in flower, and by the time we packed up, it was already almost 3 days old, so that was the first one recorded. It was also the most intricate and strange Orchid flower, looking like something out of a sci fi film, so lots to note and record. I also got sketches of the main flower spike and the rest of the plant whilst at the festival. Strangely, I wasn't at all bothered by drawing and painting in front of people after the first few minutes. But the detailed drawings will be so much more helpful. The other Orchid flowers weren't too bad by the time I got to them, the Phragmipedium sedenii was the worst and with the warm weather faded fast, so I'll have to find another plant to complete the sketches in more detail. Phragmipedium 'Bel Royal' was much better and I was able to make some really detailed sketches and colour notes of this lovely orchid before it finally collapsed. Sudamerlycaste locusta was another strange Orchid and the one I painted last, it being very robust and of a heavier texture. I'm still trying to find out what pollinates this plant - the lip is so interesting and intricate! My grateful thanks go to Dr Kevin Davies for the Sudamerlycaste locusta flower, Val Micklewright of The Orchid Society of Great Britain, for the Phragmipedium flowers, and Andrew Bannister of Orchid Alchemy, for the Stanhopea graveolens flower. 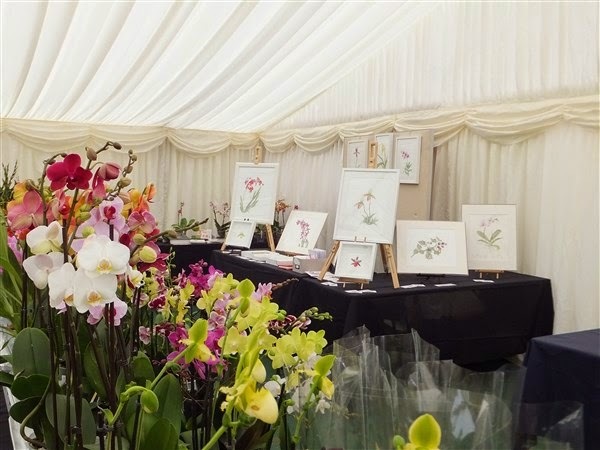 Many thanks also to everyone else at the Orchid Festival, for making it such a wonderful weekend. Of course, I also managed to come home with three new orchid plants, a Paph. sukhakulii in flower (guess what I'm working on now? ), a baby Paph. 'Vanda Pearman', and a baby Anoectochilus albolineata - as if I didn't have enough orchids already! many thanks to Francis of Phalaenopsis and More and Andrew Bannister for these plants, they look right at home here already. It sounds like you have found your specialised field, Polly! How wonderful! I'm looking forward to seeing all the lovely work that you're doing. You may be right Shevaun - I do love Orchids! Will be posting some of my work soon, but currently painting like a demon - again!